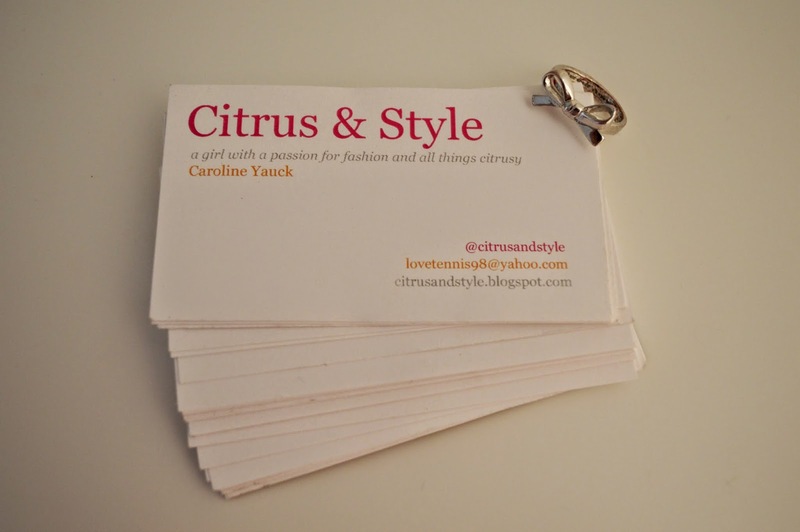 Before I headed to my first blogging conference last summer, I knew I had to design some business cards to take along with me to promote citrus & style. I wasn't really sure where to start and due to a major time crunch, I quickly headed to Kinkos and printed some pretty basic ones with fun colors. I ordered about 200 thinking I would only use a few, but ended up going through more than half! Whether you're advertising your blog or business, it's so important to carry along cute business cards so people remember you and are able to contact you after you meet them. While mine aren't the fanciest, they definitely got the job done (and hint: I'm ordering some new ones soon so stay tuned!). 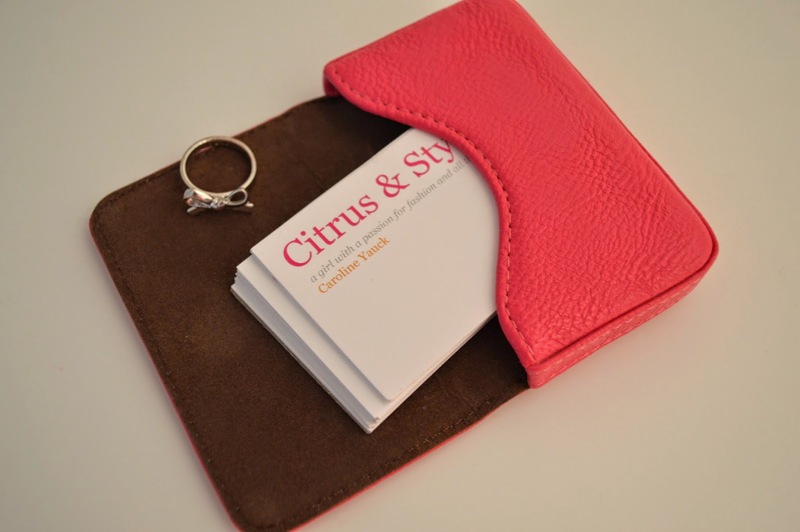 I received my business card holder as a gift but have included a bunch of super fun options below! Be sure to check them all out because they come in tons of pretty colors. 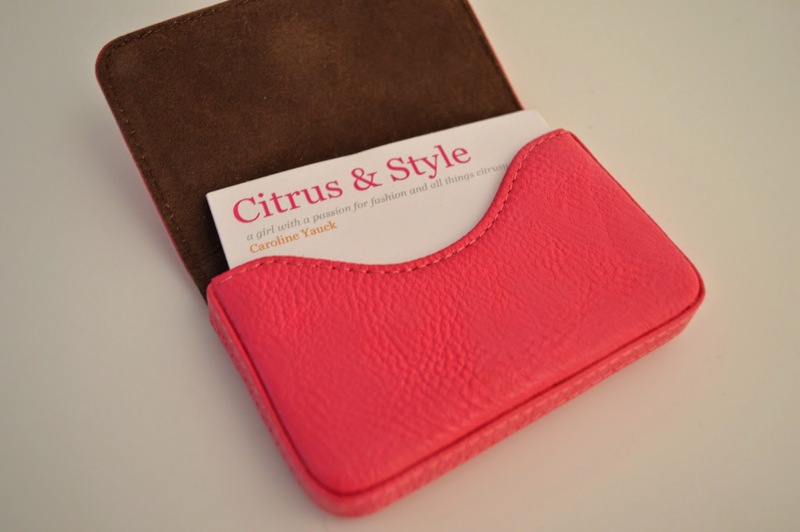 Now I need your help: where do I find cute business cards?! I'm getting my business cards from Moo for a blogging conference I'm going to over the summer! They have great products and it is so easy to create your own design! These are so cute! Getting business cards is on my list of things to do. I agree with Hunter - moo.com is a great place to order custom business cards! That's where I got mine and I love them. Wow a blogging conference sounds like fun! How do you find them? Your cards look really awesome! They will not let you down when you're exchanging contact details with your peers or potential clients. And I agree that these can be another form of advertising, because you’re actually giving your clients a glimpse of the service they can expect from you. Cheers! The present trend is to use innovative office accessories and furniture that would highlight a modern office culture, thereby enhancing your office utility. To achieve it, you can order anything like floor standing magazine holder or hanging paper cube from online suppliers of desk accessories to add to the appeal of your office and keep it clutter-free at the same time.